St. Augustine by-the-sea Church has ministered to Catholics in Waikiki – residents and visitors – for almost 160 years. Its history began not long after the first Catholic missionaries, priests of the Congregation of Sacred Hearts of Jesus and Mary, arrived on our shores. Founded in 1854, it was the third parish church established in the fledgling Hawaii Catholic Church, which was beginning to grow after a period of persecution in the 1830s. Today, a modern beacon in Waikiki with its striking neo-Gothic architecture and its dramatic stained glass, St. Augustine’s beginnings were modest indeed. The first parish church in Waikiki was a temporary chapel built under the direction of Fr. Modestus Favens, ss.cc.,It was constructed on the beach of coconut fronds and pieces of timber that had washed ashore. That site later was exchanged for a piece of land on Ohua Avenue and Fr. Modestus built another chapel of lumber from a sailing vessel wrecked near Diamond Head. It was another modest stucture, but it had a steeple as well as a bell that had been cast in France. Still, Mass was not regularly celebrated in that chapel, and Waikiki residents continued to go Our Lady of Peace Cathedral on Fort Street for Mass. 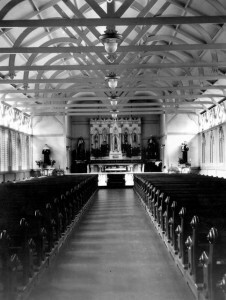 The Waikiki chapel was used for Sunday devotions, including the rosary and benediction, and stations of the cross on Fridays during Lent. It was not until 1898 that Mass was regularly celebrated in the Waikiki chapel, and it was, oddly enough, war that brought it about. The Spanish-American War had broken out and American troops transited through Hawaii on route to the Philippines. Camp McKinley was established near Kapiolani Park and Army men who were Catholics asked that Mass be celebrated for them. And so, Father Valentin H. Francks, ss.cc., was assigned to the little chapel on Ohua Lane and said Mass every Sunday. But only half the men could be accommodated in the chapel. And, shortly thereafter, it was decided to build another, but larger, temporary church. As with the first chapels, there was nothing fancy about the new church. It was four joists resting on 12 underpinnings. Coconut fronds were used for wall and roof coverings. Bishop Gulstan Ropert blessed the chapel and entrusted it to the care of Fr. Valentin. Regular services were then held for the congregation of Island residents and servicemen. Later a wooden floor was put in and the coconut fronds that had been the wall covering were replaced by latticework, while a galvanized roof gave better protection against the rain. The servicemen eventually left, but the small group of Hawaiian parishioners had come to love their church and Fr. Valentin continued to say Mass there every Sunday. Not long after he took charge of the Waikiki congregation, Fr. Valentin began planning for a permanent, more dignified, church. Fr. Valentin, who was known as a tireless worker, designed the church himself and he retained one feature from the former structure. The latticework of the new church was patterned after the palm fronds that had covered the previous, temporary chapel. The church was blessed on Aug. 28, 1901, the feast of St. Augustine, to whom the new church was dedicated. Carpenters were still at work when Bishop Gulstan Ropert arrived to bless the church, but they stopped briefly for the service. Fr. Valentin offered the first Mass in the church. The church boasted a new reed organ, but the chalice and candlesticks were from the old mission chapel. 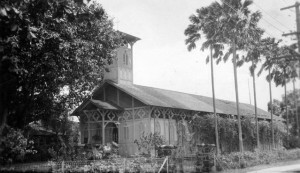 On the day of the dedication, a huge banyan tree, grown from the shoot of the old Kaiulani banyan stood to the left of the church entrance. Sadly, that tree long ago gave way to progress. The tree and a circular pool on front of the church were removed to provide parking. In 1901, the entrance to the church was off of Ohua, which at that time was unpaved, Land was purchased in 1928 to allow for access from Kalakaua Avenue. The church was enlarged twice, first in 1910, and then in 1925, the church was cut in two and a new section was inserted in the middle. The entrance was also moved toward Kalakaua Avenue. An ornamental stone arch was built at the entrance. Fr. Valentin never was in residence at St. Augustine as it did not attain the status of parish during his time. For all of the 20 years he served the church, he had many other duties. When St. Augustine became a quasi-parish on Feb. 4, 1927, Fr. Valentin was succeeded as pastor by Father Emile Rogers, who served until 1937. In 1932, St. Augustine became a full parish. Fr. Emile oversaw the construction and the opening of St. Augustine School. In 1929, Fr. Emile opened a kindergarten housed in a hall build adjacent to the church. Later, land was acquired down the street and a school with six grades was opened. The school, staffed by Maryknoll sisters, was later expanded to include all eight grades. The school was closed in 1980 because of declining enrollment and increases in operating costs. The land was purchased by the state in 1981 and the Waikiki Community Center was built on the site in 1982. The church designed by Fr. Valentin in 1901 would stand for 60 years, but time, termites and a growing population took their toll. Although the old St. Augustine church had become a Waikiki landmark and was known far and wide as the church with no windows, by the late 1950s it was clear another church had to be built. The church was beloved as a rustic reminder of earlier, gentler times in Hawaii, but was far too small for the numbers attending Mass. The church also suffered from extensive termite damage, and in late 1959 the diocese announced that the old church would be razed and a modern, air-conditioned church, designed by local architect George McLaughlin, would be constructed in its place. Original design plans called for a stained glass rose window at the entrance to the church, but that was replaced by a striking stained glass depiction of St. Augustine of Hippo, for whom the parish has been named for more than a century. The present church was blessed on Aug. 16, 1962, by Bishop James J. Sweeney. An oasis of faith in the midst of a busy resort destination, St. Augustine has welcomed the famous and the ordinary over the years. But its links to its beginnings remain strong. Those continuing connections include the legacy of its many long-time parishioners and the Sacred Hearts fathers and brothers who have led the parish since its start. In addition, a koa baptismal font and a tapestry of the Immaculate Conception remind modern worshippers of the parish’s rich past. The koa baptismal font was a gift from Prince and Princess David Kawananakoa, whose daughter, Kapiolani, was baptized at St. Augustine in 1903. The tapestry, according to early accounts, once belonged to a convent in Boston that was destroyed by fire during the anti-Catholic uprisings in the 1800s. The tapestry, probably from Ireland originally, was sold at auction and was brought to Honolulu by a friend of John Ena, who acquired it and presented it to Fr. Valentin. For almost 160 years, St. Augustine Church has had a strong pull on those who have been a part of its long history. According to church legend, when Fr. Valentin traveled to Rome in 1905 accompanied by Bishop Libert Boeynaems they stood in the piazza of St. Peter with the basilica before them and the walls of the Vatican rising above them. “Awe inspiring,” said the bishop. Today, St. Augustine continues as an integral part of its Waikiki community.